Given that lay people often fail to understand what the clergy do during the week—“Preacher, it must be nice to work just one day a week”-- we can understand why clergy do not have an appreciation for what their parishioners face during the days when they are not at the church building. Most clergy have held only temporary or part-time non-church jobs (although this is changing as median age adults are responding to the call to ministry). Few clergy today visit their members at their place of employment; in fact, often the laity don’t even work in the same community where they reside and attend church. Even if the pastor was employed in business before responding to the call to ministry, he or she may not be familiar with the stresses that are peculiar to the settings where their members work in 2013. This can be addressed in many ways in the church, but the process of making the connection can begin in the seminaries, schools of theology, and divinity schools where clergy are formed and informed for ministry. In his article on “Theology for Workers in the Pews,” Chris Armstrong suggests how these institutions “are helping business leaders to think ethically and theologically” and also “helping clergy to engage more intelligently with business leaders in congregations.” His recommendations suggest some ideas about steps that theological institutions can take to foster an interactive dialogue between church world and business world. First, seminaries could partner with businesses to offer staff development experiences in the workplace taught by seminary professors with ministry students as small group facilitators or teaching assistants. Some possible topics might be ethics, interpersonal relationships, and servant leadership. Second, Armstrong suggests that seminaries rethink their approaches to field education. Rather than limiting ministry praxis settings to clinical pastoral education (CPE) in hospitals, prisons, and psychiatric wards or field education to congregations and church-related ministries, students might do internships in businesses where they would shadow executive leaders, work with employee assistance programs, or resource teams working on community service projects. Third, seminaries could take advantage of the experiences of local business people, especially those who lead entrepreneurial endeavors, by inviting them to campus as speakers, guest professors, or symposium participants. Discussions about vision, values, business practices, and quality of life in the workplace would benefit the business leaders, the seminary leadership and the students. If seminaries can begin the process of theological engagement with the workplace during the minster’s seminary days, they will open doors for more effective dialogue when the students begin serving local congregations. Leslie Newbigin, Christian missiologist, was ahead of the curve when he wrote in 1986 about the need for “a theology that has been wrought out at the coal face, at the place where faith wrestles at personal cost with the hard issues of public life.” In this section of Foolishness to the Greeks, Newbigin calls for the church to encourage and equip the laity who are on mission in the world seven days a week—in the office, the coal mine, the classroom, the shop. In a recent article entitled “The Other 100,000 Hours,” Chris R. Armstrong argues that the church has not only failed to tackle this opportunity but has often “marginalized itself from the world of work.” Armstrong believes that pastors rarely address the world that parishioners encounter when they go to work and often either misunderstand or are ignorant of the workplace. Clergy leaders are much more concerned about what happens within the walls of the church than in the workplaces outside the church. Armstrong suggests that the workplace can provide the venue for grace, self expression, and formation in the life of the believer, not only for himself or herself but also in relation to others. The person who is employed outside of the home spends more time with fellow workers than with their family members, so the opportunity and challenge of being a Christian is even greater than what one might exercise in the home or church. Why do clergy miss this opportunity? One reason is that many have never held a regular workplace job outside of summer or school break jobs. They have never experienced the “daily grind” of the workplace. Therefore, they do not understand it or have the vocabulary or experience to address what happens there. This is an opportunity for an expanded ministry that most clergy and their churches are missing. It is also central to our efforts to encourage the people of God to be the missional church ministering both within and without the church walls. Both Newbigin and Armstrong challenge us to understand this. In a subsequent blog, I will suggest some ways to rectify this oversight. As we nurture our children, we gradually give them new opportunities for responsibility and independence. We encourage them to dress themselves and pick out their own clothes. We provide food options (all healthy, of course) that they can choose. We provide books and games that will stretch them mentally. We start acting “as if” they were older and encourage them to move to the next level. A church that desires to grow must start acting in the same way. I often say to pastors, “If your church wants to move to the next level, you must start acting as if you were already at that level.” This means providing adequate staffing, sufficient worship opportunities, differentiated educational groupings, and challenging ministries. For example, if your church wants to have a quality children’s program that will attract and retain children, you need to develop one. Perhaps you only have two or three children attending now, but you can start staffing and planning as if you had a dozen children. When a parent brings a child to your children’s ministry, he or she will see that you are providing more than the minimum; you are expecting children and prepared for them. This acting “as if” applies to the pastor as well. Perhaps you have been the chaplain of a family sized congregation. In order for the congregation to move to the next level, you may have to become more of a coordinator and administrator. Rather than serving as a “sounding board” for the church’s matriarch or patriarch, you may have to lead through personal relationships by delegating, assigning responsibility, and recognizing achievements of others. If we act “as if” with diligence and commitment, we soon find that we have arrived at our goal. Someone has said, “Fake it until you make it,” but we are talking about more than just “faking” it. 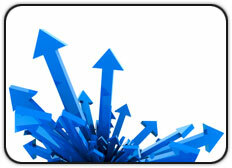 We are talking about providing the structure, resources, and leadership that will accommodate the next level of growth. If you don’t do this, you probably won’t grow. I first saw an episode of Star Trek: The Original Series in reruns of the first season. The program launched while I was in Vietnam, so I was surprised when I returned to the States and discovered it. My family and I watched that series in reruns for years. I have also followed the four subsequent TV series and the ten movies that featured the original cast and the cast of Star Trek: The Next Generation. Not all of these incarnations of the franchise have been satisfying experiences, but I have tried to follow the various twists and turns of the Star Trek universe. 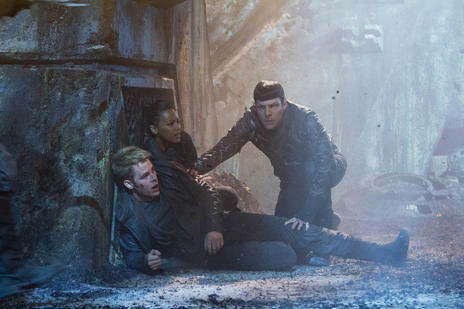 Abrams has reenvisioned Star Trek by taking us into an alternate time line from all of the other movies and television shows. 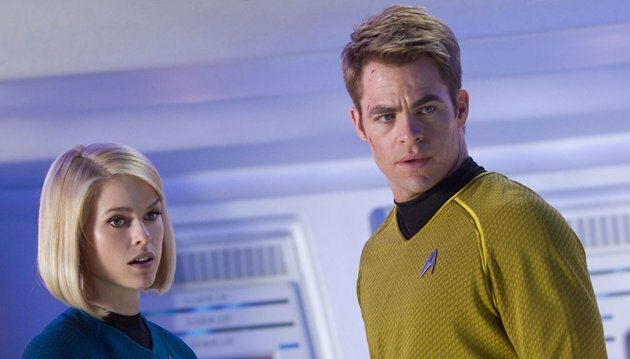 This is Star Trek for the big screen (as well as 3D). He has refashioned the feel of the franchise with a lot of action, expensive and effective special effects, and fresh young actors. The actors in the new movies are for the most part young (most appear to be sophomores in college), attractive, and very engaged in their parts. They seem to be enjoying their work. Is this your father’s Star Trek? No. For one thing, Gene Roddenberry, the creator of the original series, was an unabashed humanist. He conceived of a time when human beings had learned how to work together with no poverty or hunger and a respect for all cultures, races, and philosophies. The primary conflict in the original series came as the central characters explored new planets and encountered and alien races. Although Roddenberry was an idealist and created an idealized future, his scripts addressed racism, prejudice, and other social issues. This carried over in The Next Generation series as well. 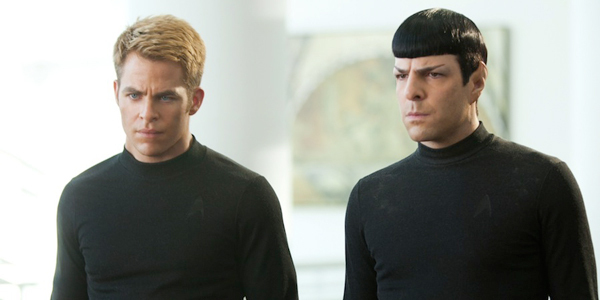 I must admit that I struggle to understand the philosophy behind the new version of Star Trek. In many ways, it is Christian fundamentalism at its worst. Characters are rarely complex—they are either good or evil—and those who are evil have no redeeming values. Even the good folks don’t seem to know why they are doing good things. There is a lot of anger and destruction driven by a desire for revenge. My second reservation is the conscious efforts in Abrams’ movies to reference the original series in both its TV and movie presentations and “the original timeline.” It is especially clear in the current film that brings back a villain from a TV episode and one of the better movies, as well as inverting a very familiar scene from that movie. Even a character from the original series has a cameo. Who is this for? Is Abrams attempting to appeal to and appease the Trekkie fan base? If so, it gets in the way of good, interesting story telling. I almost expect the whole film to be revealed as a Saturday Night Live sketch but one with little substance or originality. If Abrams wants a fresh start, then get on with it. The special effects are dazzling, the cast is attractive (although their personalities are not well developed), and the action is continuous. But this is not great film making. If anything, it is Star Trek light for an audience with a short attention span. My rating: Two out of a possible five stars. Telling the emperor he has no clothes can be tricky. You remember the fairy tale about this. As I remember, the naïve young boy came out of the encounter unscathed, but the emperor was totally embarrassed. When I was in Vietnam, I was an inexperienced, freshly minted second lieutenant in a logistics company. On one of my early assignments, I was detached to work with a unit on the coast. Landing craft would come up from Cam Ranh Bay loaded with 5000 gallon tank trailers full of gasoline. When they arrived on the beach, the contents of the tankers would be pumped into other tankers that then took the product to the troops. Pumping the gasoline from one trailer to another was time consuming. I was observing the operation (that’s what officers do) with the lieutenant colonel in charge and made the comment, “Sir, wouldn’t it be easier just to exchange tankers? We pull the loaded tankers off with the tractors, put the empty ones on the LST, and send them back to Cam Ranh Bay to be refilled.” He looked at me, and I expected him to say that was dumbest thing he had ever heard, but instead he said, “That might just work.” I am sure that we violated some regulations by the change, but it became standard procedure on that beach and saved a lot of time. I was not so fortunate on another occasion. I was involved in a planning team with the executive director of a denominational judicatory I served. We had been encouraged to be open and honest about ways to improve the way the organization worked. Another member of the team and I suggested some ways that the executive office could communicate more effectively with members of the organization. The response from the rest of the team was silence and a disapproving look from the executive officer. Needless to say, our suggestions were never implemented. What are the lessons here? For the person who is “telling the truth” as he or she sees it, the motivation to speak must be a desire to make things better for all concerned without seeking personal gain. Second, care must be taken to address the process and not a person. When it appears that the focus of concern is on a person, defenses go up. Third, no matter how good you feel that your idea may be, it will not necessarily be accepted. Fourth, begin honest has consequences and they are not always good ones! There are some lessons for the hearer—the recipient of the message--as well. First, assume that the person making the suggestion wants to make things better for everyone, including you. Second, try to suspend judgment on the suggestion (and the speaker) and consider the possibilities that result from pursuing their idea. Third, don’t take it personally. If you really care about your organization and want to provide effective leadership, you need to hear other points of view. There is always some risk involved in providing another point of view to someone in position of power. 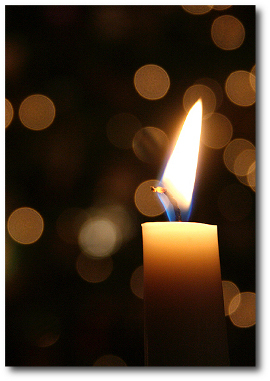 The person may feel threatened or offended and may choose to reject both the idea and the messenger. The bottom line is, “Do you want to work for an organization that won’t even consider other options?” If not, find a place where your creativity and initiative will be encouraged and rewarded. In talking to church leaders, however, I have discovered that many have no roadmap for the journey of Christian growth. Whether they are deacons, Sunday school teachers, small group leaders, or committee chairpersons, they have no way to assess their growth in discipleship. First, prayer. Ask yourself, “How often am I engaging in direct, honest conversation with God?” Prayer can easily become either formalized ritual that we practice without a second thought or a necessary task that we “farm out” to the church staff. Second, Bible study. A growing disciple should consider the question, “Am I engaging with Scripture in such a way that it not only informs my understanding but transforms my life?” There is a significant difference between reading scripture for informational purposes and reading it for life transformation. Fourth, evangelism. Although it may be uncomfortable, ask “Do I understand my own faith story enough to share it with another person?” Every believer has a personal story that intersects with God’s story. What’s yours? Fifth, concern for the marginalized. Ask, “Do I personally engage in some form of Christian service for the needy or the marginalized of my community?” Jesus said more about carrying the poor, hungry, and imprisoned than he did about any of the four previous items in this list. Sixth, stewardship. Take the time to consider this question: “Do I have a balanced life when it comes to allocation of the resources God has placed in my hands—money, time, and talents?” God has blessed in many ways. How are you using what God has provided? Most of these are hard questions that make us uncomfortable, but how we answer them gives some idea of where we are in our growth as disciples. I will return to each in upcoming blog posts. 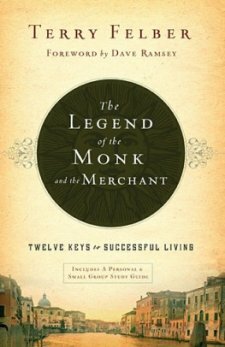 In The Legend of the Merchant and the Monk, writer Terry Felber suggests twelve keys to successful living that can guide a Christian in his or her personal, business and family life. Setting his parable in 15th century Italy, Felber uses Antonio, a successful Venetian merchant, as the spokesperson who communicates these principles to his grandson. The historical approach is interesting and provides a good setting to discuss the complementary roles of the secular and the sacred in society. Antonio is a man of faith but he struggles to know the best way to use the resources that God has placed in his hands. He is helped along the way by Allesio, a merchant who becomes his mentor. The principles themselves deal with all areas of a person’s life. They encourage one to make the most of one’s gifts and to be a good steward of the blessings that result. Although they are common sense principles, Felber presents them in such a way that they seem fresh and challenging. Taken together, they provide a sound theology of vocation. The book includes a twelve-session study guide for use in a group. It is a good read for an individual or as the resource for a discussion group. Iron Man Three, the latest film offering from Marvel Comics, gives us an anxiety-ridden superhero. Tony Stark, AKA Iron Man, has come away from the epic battle alongside the other Avengers in New York (see The Avengers from last year) as a changed man. The bravado and sarcasm is still there on the surface, but underneath is a person who has difficulty sleeping, fears for the safety of loved ones, and often succumbs to anxiety attacks. Marvel led the way in giving us superheroes with problems—the Hulk and Spiderman come immediately to mind. In recent years, graphic novel and movie adaptations have provided DC Comics heroes like Batman with angst-ridden back stories. This approach was central to the just-complete Batman movie trilogy. The television series Smallville attempted to do this with the Superman story, and usually succeeded. It will be interesting to see how the upcoming Man of Steel movie will approach this legendary superhero. Although some will say that we live in times when we want our heroes to have feet of clay, I would take another tack. I think we want heroes with whom we can identify. People that deal with the same emotions we do, even if they have extraordinary powers. We want heroes who need other people and value relationships. In Iron Man Three, Tony Stark discovers there are several people he needs and at least one of the most important ultimately comes to his rescue. Sometimes we are tempted to see a superhero as a Christ figure—an all powerful being who has come to save us. In reality, the latest incarnations of the superhero are examples of humanity in all its glory and failure. The superhero always has a flaw. Even Superman could be hurt by Kryptonite. What we see in these current examples is that internal flaws plague us all and we can only overcome them with the help of others. In recent years, I have developed great admiration for megachurch pastor Andy Stanley as I have heard him speak and read some of his writing. He is an effective preacher, a practical leader, a transparent believer and a lifelong learner. We might disagree on some fine points of theology, but I have learned a lot from him. Stanley is much more open to women in leadership than most people realize. It will come as a surprise to many that women serve in practically every role at North Point Church. He also acknowledges that women serve as pastors (although not at North Point), and he includes them in his comments in this book. Therefore, I have found myself recommending his new book Deep and Wide to a number of people. The subtitle of this new book is “creating churches unchurched people love to attend.” It is that and more—personal testimony, preaching insights, practical guidelines about discipleship, and a kick in the pants to do something different. Stanley does not consider himself a church planter but he is definitely an architect of church culture. In this book he explains candidly the personal struggles involved in breaking with his father and launching North Point Church and then goes on to provide an inside view of the church’s intentional approaches to building a culture, reaching the unchurched, forming disciples, and preaching the Bible. The seven questions he provides beginning on page 304 are well worth the price of the book. Stanley understands that good questions challenge us to self evaluation, provoke our discontent, and encourage us to change. If the church or any other organization is to be a “learning organization,” it must ask pointed questions and learn from the answers. Having children is not a matter to be taken lightly. In fact, I have friends who have decided for one reason or another not to bring children into the world. I am thankful that Rita and I chose to have children. Of course, this has resulted in grandchildren and great-grandchildren, and each one is an additional gift. For me, having children is an affirmation of life, a belief that the world can be a better place and that the parent is willing to put that faith into action by bringing new life into the world. Having children carries the implication of raising them and that carries with it both challenge and growth. As we raise children, we learn a lot not just about them but about ourselves as well. We are forced to evaluate our priorities, our goals, and our investment of time and energy. There are many estimates of the financial investment involved in raising a child to maturity, but how does one count the investment of nurturing, loving, and caring for a child to maturity? The personal growth to the parent from raising children has many facets. As a person raises a child, he or she learns a lot about themselves. A parent gains new insights about the world as he or she sees the world through the eyes of a child. Growth involves pain and every parent learns and grows from the pain involved in walking with a child through rebellion, loss, and disappointment. 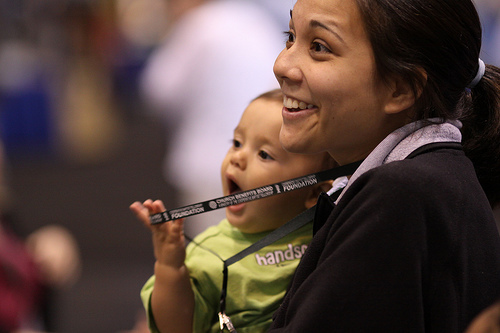 A parent is also energized by the achievements and triumphs of the child as he or she faces life challenges. Having children is both a privilege and a responsibility. Is the investment worth it? Yes. On this Mother’s Day, we can be grateful for parents who made that investment in each of us.